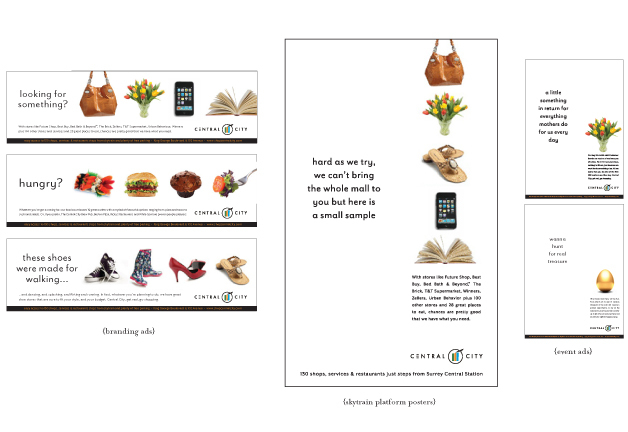 In 2010 I developed a rebranding campaign for Central City Shopping Centre. The campaign was designed to reflect the stunning and unique architecture of the shopping centre and diverse tenant mix. Because the centre also incorporates a university campus and offices the branding was clean intelligently written and focused on everyday needs to target students and office workers. The branding used primarily newspaper and outdoor media to promote key categories in the centre and is complimented by promotion-specific advertisements in newspaper and in-mall applications. By blending custom photography with royalty-free images I was able to extend the budget without compromising the look. Ads were designed with a very sleek unique layout. I used a lot of white space to allow the information to stand out from the surrounding clutter in newspapers and magazines. The main thrust of the campaign was to brand the centre and show people the wide variety pf products and services available. The food court was featured as it is one of the largest food courts around and very popular with the students and workers in the adjacent towers. 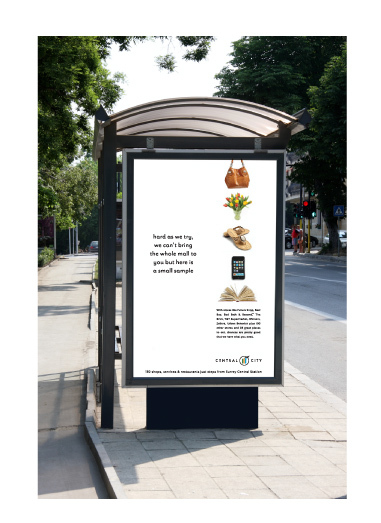 Banner ads were created for premium placement in local newspapers. Matching interior transit cards were placed at the same time. Transit shelter and platform poster ads were integral to the program as Central City Station is a main hub on the Skytrain line.